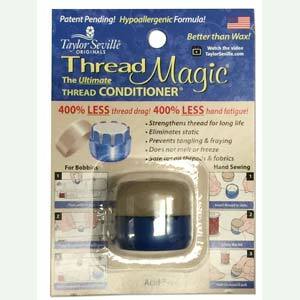 Thread Magic by Bead Buddy conditions and protects thread, making working with the thread easier. It helps reduce knotting and tangling of threads. It comes in a re-closable, easy to use, container. Container is approximately 1.2 inches in diameter by 1 inch tall. -Reduces knotting and tangling in threads. -Reduces thread friction and drag 700% over untreated thread. -Protects from color-damaging UV rays, mildew, and mold. -Designed for both hand and machine sewing. -Does not melt or freeze. Temperatures over 600 degrees F it simply evaporates. -Acid-free. PH level is 7. -It is not a petroleum product. It is a safe, synthetic chemical compound.